The legend of Valentine’s Day goes back to 270 A.D., when the Roman Emperor Claudius II banned marriages and engagements because he decided that single men made better soldiers than those with wives and families. However, a Holy Priest believed in love and took a dangerous stand to secretly perform marriages. His name just happened to be St. Valentine. Unfortunately, his actions were discovered by the Emperor and St. Valentine, the defender of love and marriage, was found guilty and imprisoned with the ultimate threat of death as punishment for his deeds. While in prison, St. Valentine fell in love with the jailor’s daughter. As he was being taken away to be executed he left his true love a love note signed, “Love, your Valentine”. 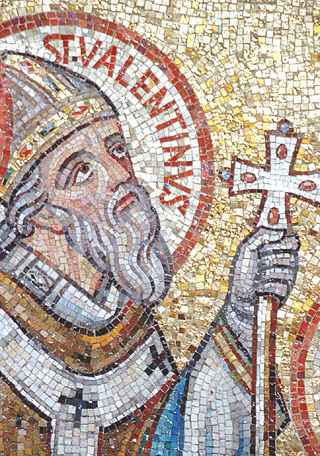 St. Valentine was executed on February 14, around 270 A.D.
Side note: There are three different Valentines in history executed for defending their beliefs. My Favorite Family History Trip EVER!